A simple chicken breast is well known as a healthy entree, but most people don't realize that chicken legs are also a healthy choice. Dark meat chicken, found in the legs and thighs, contains iron-rich myoglobin. Dark meat also contains more zinc and B vitamins than a chicken breast and is rich in calcium and potassium. For a healthier chicken leg, remove the chicken skin. By skinning a 6-ounce serving of chicken, you save 11 grams of fat. Choose from a variety of seasonings to flavor your meal, then bake or broil for a healthy main dish. Create a seasoning mix of your choice. You can use a commercial rub mix or make your own seasonings from herbs and spices. Good flavor combinations include soy sauce, garlic, pepper and dried parsley. Alternatively, marinate chicken for up to 8 hours in a mixture of honey, Dijon mustard and curry powder. 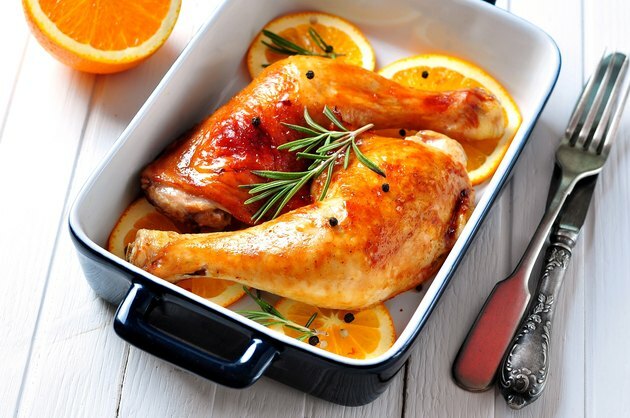 If you wish to serve the chicken with a sauce, simply coat the chicken lightly with olive oil or melted butter and season simply with salt and pepper or lemon pepper. If you like your chicken breaded, toss chicken legs in bread crumbs after seasoning. Remove the skin from chicken legs. Season the chicken with your choice of herbs or spices. Line a roasting pan with foil for easy clean up. Spray the roasting rack with cooking spray to prevent sticking. Place the chicken legs on the rack of the roasting pan leaving space between each piece. Place seasoned chicken under a preheated broiler, 4 to 5 inches below the broiler. Broil the chicken legs for 10 minutes. Turn them with tongs and brush them with more oil, seasoning mix or marinade. Broil for another 10 minutes or until the chicken is tender and the juices are clear. Chicken legs are done when the internal temperature reaches at least 165 degrees Fahrenheit on an instant-read meat thermometer. Place the prepared chicken on the center rack and bake it for 45 to 50 minutes or until the chicken is tender. Check the internal temperature with an instant-read meat thermometer. Chicken is safe to eat when the temperature reads at least 165 F. Many cooks prefer to cook chicken to 185 F.